M.A.G.I.C Windows Smartphone Has Everything! Currently hovering betwixt prototype and retail status, Advance Tech Communications new Windows Mobile smartphone market looks hot! hot! hot! 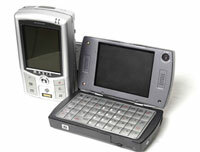 The MAGIC (Mobile Advanced Global Integrated Communicator) comes stuffed to the gills with connectivity and multimedia options, and is powered by a beefy Intel Xscale 624 MHz CPU with graphic accelerator 2700G3 and Video RaM – fast enough to leave all current Windows Mobile phones coughing in the dust. 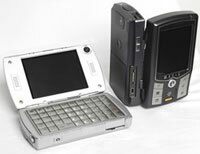 The 10.5 ounce (300 g) Windows Mobile 5.0 device comes with more connections than a street spiv, offering GSM quad band, GPRS, Wi-Fi 802.11b, EDGE, Bluetooth 2.0, IrDA FIR 4 and, of course, USB. 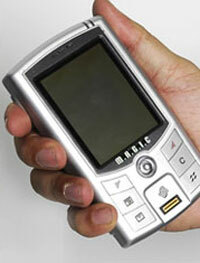 There’s also a built-in Global Positioning System( GPS) and, apparently, a Biometric Sensor. On board storage is taken care of courtesy of a generous 8GB hard disk, backed up by 512MB RAM and 512MB ROM, with a micro-SD expansion card slot. There’s two 2.8″ QVGA (320×240 pixels) displays onboard and – you’ve guessed it – there’s also two cameras, both offering a healthy 2 megapixel resolution. Wrapping up the extensive feature set is a very useful VGA Out port and a small QWERTY keyboard for the tippity-tap action. With all this functionality crammed in to the phone, it seems that Advance Tech felt that describing the ultra-premium device as a ‘smartphone’ would be like calling a Leica camera a point’n’shooter. Instead, the company are proclaiming their new device to be a “laptop computer miniaturised to the size of a handheld device,” which perhaps isn’t the snappiest description they could have come up with. With its ten-mile long spec sheet, it’s not surprising to find both price and physical size are going to be on the b-i-g side, with the MAGIC measuring up at 125 x 70 x 32 mm and the price hovering around the high end $1,000 mark (£575, €838) . The MAGIC is expected to roll out next quarter.